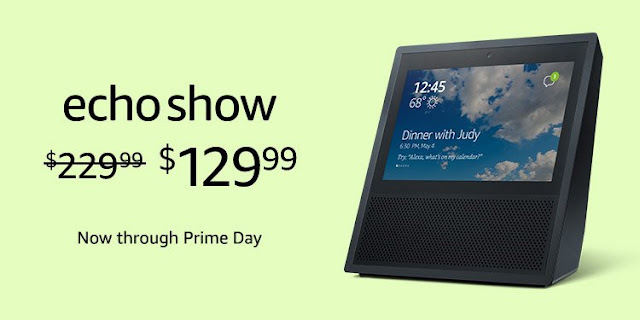 Lead up to Prime Day has started and right now Echo Show: Save $100 on Echo Show, which brings you everything you love about Alexa, and can show you things. Make video calls or watch video flash briefings, movies and TV shows, see music lyrics, smart home cameras, photos, weather forecasts, and more. All hands-free—just ask. · Amazon Brands – Find our lowest prices on products from collections available exclusively on Amazon, including up to 25% off furniture and décor from Rivet and Stone &amp; Beam, up to 20% off AmazonBasics items, and 30% off everyday essentials from Presto!, Mama Bear and Solimo, among others. · Prime Video, DVDs and Blu-Ray – Save up to 50% on popular movies and TV shows on digital, DVD and Blu-Ray. Prime Day is back this year starting July 16 at 12pm PT/3pm ET and will run through July 17. It's an epic day and a half of our best deals, promotions and great possibilities for you. Make sure you are ready to earn big! As a reminder, you can start your Prime Free Trial HERE! Every day leading up to Prime Day, members will discover all kinds of exclusive offers and deals. Take advantage of 4 months of Amazon Music Unlimited for only $0.99 (regularly $7.99 per month for Prime and $9.99 for non-Prime)! New subscribers only. Two great offers both available starting now! You'll love getting 66% off a 3-month membership of Audible Gold ($30 savings!). New subscribers only. New for Prime Day this year, you'll love the special limited time offer of $0.99 for 3-months of Kindle Unlimited for new subscribers (regularly $29.97)! Offer starts today. Off-to-College shopping season is here! Every qualifying Prime Student 6-month trial. HUGE for Prime Day 2018 especially for gamers and college students! Prime members get exclusive benefits on Twitch, the world's leading social video service and community for gamers, video game culture and the creative arts. There will be a free daily video game starting today exclusive for Twitch Prime members! Starting today through Prime Day: new-to-Pantry customers get $10 off $40 Pantry order and free delivery! As part of their Pantry membership, you can skip the trip to the store and enjoy free deliveries of regular everyday-sized pantry items (with minimum spend of only $40 per order). Save time and money by starting a free trial of Amazon Fresh, which now includes a select assortment from Whole Foods! NEW for Prime Day 2018 – starting today through July 17, Prime members who start a free trial can also get $30 off their first order (PROMO CODE: 30FRESH). Existing customers can also use this same promo code from 7/3 through 7/17! Amazon FreeTime Unlimited is an all-in-one subscription for kids that offers unlimited access to thousands of kids' books, videos, movies, TV shows, and growing library of Audible books, skills and music. Available across Fire, Echo, Kindle &amp; Android compatible devices. For a limited time, parents can get a 3-month pre-paid plan at $2.99 (regularly $29.99).